You’ve Finished your bracelet, you’ve given them to friends and sold them to more friends and then one day, one of your friends writes to tell you that the elastic bracelet you made for her broke and beads flew everywhere, at her favorite restaurant! Embarrassing for her and for you as a maker, it can be tough to get over the fear of this happening again and again. - The Knots Are not tied tight enough, the wrong knots are used, and there is no glue to hold them together. 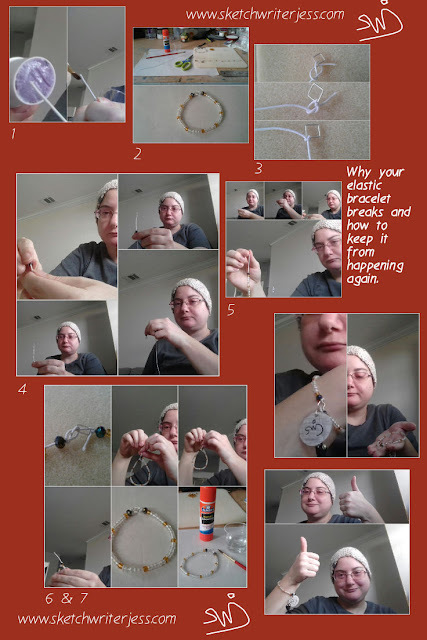 - The elastic cord size is not correct and the beads are too heavy, so the bracelet breaks apart. - One large knot is used to tie the bracelet ends together. This puts so much weight on the strand that with wear, the strand will rub against the beads too many times and it will break. 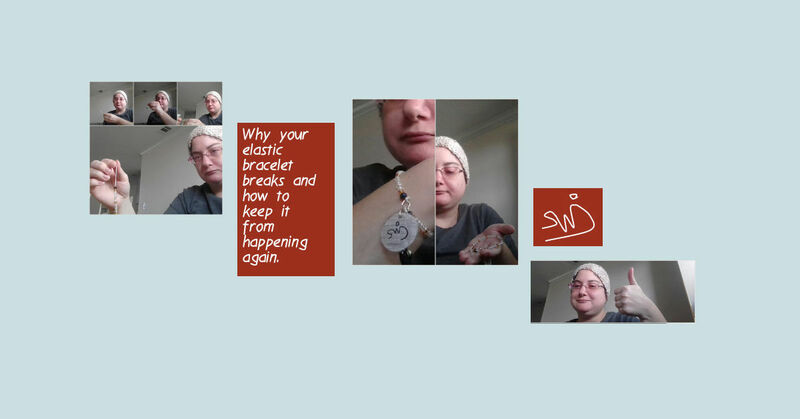 This blog post you are reading will not only tell you the solution to the problem, it will guide you through how to make the beaded elastic part of a bracelet I have just created recently. The secret is in how the bracelet is put together. There is a balance to it that allows it to be worn multiple times without stress on the elastic strand, so it will glide over your hand and once snapped in place by your fingers against your wrist, it will stay in place, strong and sturdy without worry of it falling apart. Lets get started with the materials needed to make the elastic bracelet I am demonstrating in this post. 9” of 1 mm Elastic Cord, White, cloth covered. 1.Take the elastic cord you’ve cut and run glue over one end of the strand. The brush the glued end with water. Glue to a half inch down the strand from the end. Set aside to dry until lightly damp and sticky. 3.Take the end of the Cord that does not have glue and tie it to one corner of the square jumpring. First, tie a figure 8 knot, then tie an overhand knot. Do not cut the tail yet. Leave about an inch tail. 4. String the Beads in the order listed on the pattern. Pick up the bead with your non-dominant hand and hold the cord in your other hand. 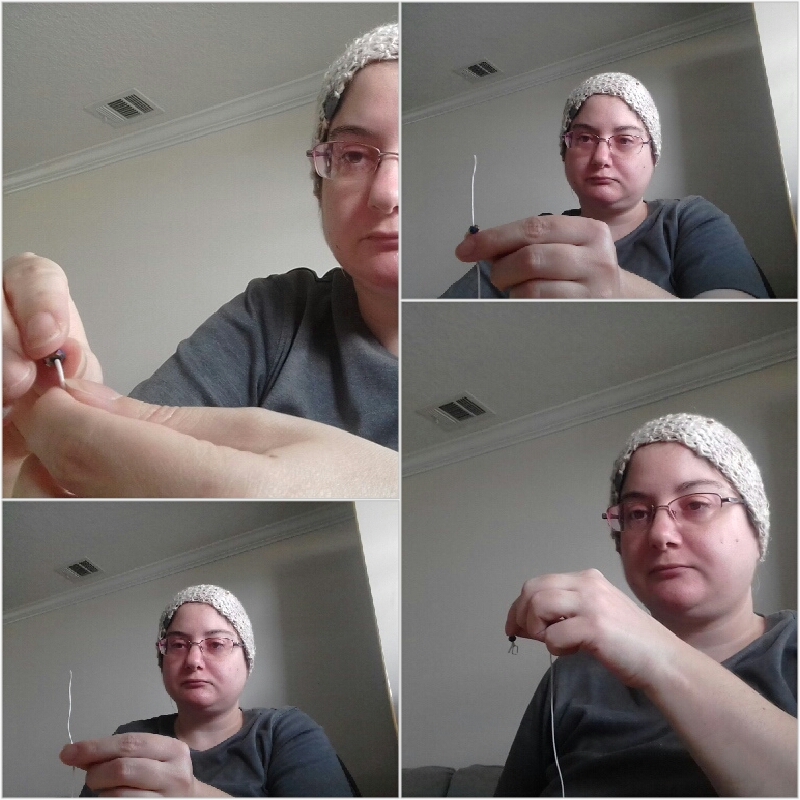 Push the bead onto the cord, then slide the bead down the cord with your hand that is holding the cord. Continue beading the pattern on to the string. Be sure that all the elastic is covered under the beads, until you are finished with the bead pattern. There should be about 2” left of Cord for tying the knots onto the jumpring. 5.Tie one figure 8 knot onto the opposite corner of the squre jumpring across from the other knots tied. Push the knot towards the beads. Then tie an overhand knot inward towards the beads. 6. Cut off the tails. 7. Run glue stick over all the knots and brush with water. Do not move the bracelet, put charms on the Jumpring, or Wear the bracelet for 24 hours. After 24 hours, it is safe to finish the bracelet with charms if desired. Also nudge the knots off the corners so the bracelet is more flexable when wearing. It will still be stable to wear and will not break. I use a glue stick and water because not only is it non-toxic, it breathes. It’s flexible. Jewelry cement is not. I like the idea of the beads being able to move on the cord and it makes the bracelet more comfortable. I use a square jumpring because I think it adds balance to the bracelet. The knots have a place to sit on instead of moving around so much with wear. And one last thing about this method of making an elastic bracelet, not only can you use a square jumpring, you can use a link that has corner edges with a stone in the middle of it, You could make a piece of wirework design as long as it has corner edges. I will show you options for what I have mentioned here in future updates on this blog. Share away, yay! Or Nay! Wa wah. If you are on Facebook, Please Like this post on the Sketchwriterjess Facebook Page. If you like and follow my page as well, you will get updates posted, not only from this blog, but from my other blog on Tumblr, swjreads. On that note, I will not be publishing the Tumblr blogs to this main blog any longer, I post it in other places that are more appropriate because the swjreads blog is more of an editoral blog, rather then an infomation hub for this art and craft business. swjreads will be shared on Friday, not the same day as the main blog anymore. Thank you for reading. Consider this presentation practice. In December I will have an e-book for purchase with the techniques discussed in this presentation if you would like to continue your study. Fantastic post.Thanks For share this post with us.Bangles ar quite common, particularly in bound cultures like Asian and African countries, however conjointly in different areas. string bracelet Bangles ar product of numerous metals and should be adorned with stones, crystals, pearls or different sorts of ornamental materials. Thank you for commenting. I'm glad you liked my post. I've got an update coming up, a new version of this one that includes making the jumpring for the elastic bracelet.